“We’ve got trucks and vans barrelling through the picket line of a group of mostly women who are exercising their constitutional right to improve their working conditions and the quality of care they provide,” said Thomas. What if it was fists not cars? The roughly 30 nurses, clerical and custodial staff of OPSEU Local 276 are simply asking for pay and treatment equal to workers doing similar work at other community health clinics. Strikes are never Sunday school picnics—but the strike at the Owen Sound clinic is particularly nasty and mean. The attitude of the three millionaire doctors who own the clinic have made it that way. The Owen Sound Family Health Organization is a private business—set up to make money for the doctors who own the building and hire the staff. Their goal is the same as any business: namely, reduce costs and increase volume. Their “clinic” is run more like a factory turning out widgets, than a medical care facility handling vulnerable people: dozens of doctors service more than 30,000 patients, who they cycle through as quickly as possible. Working there is no fun (more than 70 people have quit over the past six years.) Quality of patient care suffers due to management practices. This rigid and self-serving management style led to a complete breakdown in attempts to negotiate a strike settlement. OPSEU filed a complaint with the Ontario College of Physicians and Surgeons against the owners of the Family Health Organization and some of their senior administrators over the harassment and some abusive language directed at the striking workers. The conduct of the employer is shockingly unprofessional and OPSEU is demanding the College hold the clinic owners accountable, said OPSEU First Vice-President/Treasurer Eduardo (Eddy) Almeida. The drivers who recklessly drove through the picket line were a dangerous extension of the highly-charged, insulting and disrespectful approach from the doctor-owners. Misogyny is another troubling aspect of the doctors’ rude and crude attacks on the strikers. Most of the 30 workers on strike are women. The fact that “mere uneducated women” would have the audacity to stand up to the men running the clinic seems to trouble the managers as much as what the workers are asking for. But the longer the strike goes on, the stronger the workers are feeling. Recently a group of them commemorated their solidarity by getting matching tattoos, the Celtic symbol for sisterhood. 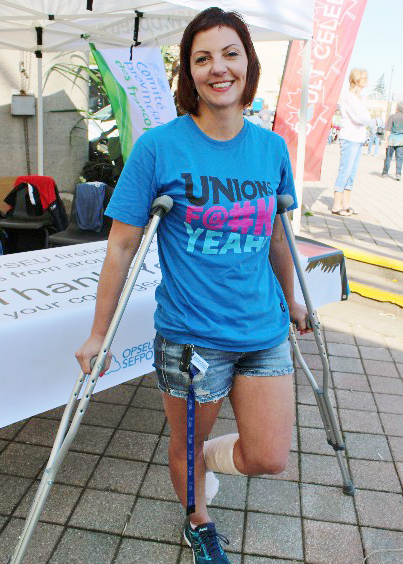 The doctors finally agreed to sit down again for talks with the union on September 4.